After learning about animals through text and in class, we were finally able to go see the actual animals! Fortunately, on Friday morning rain wasn’t falling. First, we went straight to the horses. 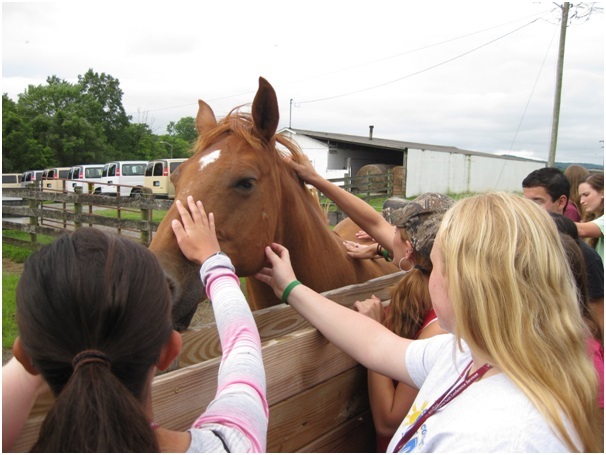 A friendly brown mare named Brownie greeted us when we first arrived, and we learned about how horses foaled. We continued our animal adventure, and were greeted by an unpleasant odor as we opened the van doors; the next animals on the agenda were pigs. We split up into two groups as we visited the pens of the sows, barrows, and the nurseries where piglets were kept. The first group was very lucky to see the birth of some piglets! We learned that baby pigs are born with very little fat, so they have to be kept warm by a heat lamp. Next, we drove to go see some cattle. 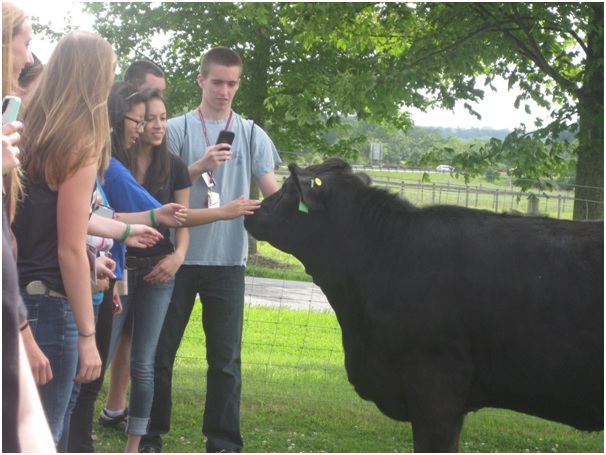 We saw different breeds of cattle including Angus, Charolais, and Simmental. They often breed Simmental and Angus cows to give Simmental cows the black hide that consumers prefer over white or smoky brown. Our last trip was to the sheep center, and the demonstration of herding sheep was very interesting as sheep are very timid animals and are easily frightened. The animal adventures were entertaining as well as informative, and we learned so much more than sitting in a classroom and learning about animals on Powerpoint slides!